Ford Edge ST Overview | Appel Ford Inc.
Have you seen the all new Ford Edge ST? It’s one of the top midsize SUVs for its class due to its power, reliability, interior, and safety. Most drivers can’t believe that Ford has waited so long to redesign the Edge, but here it is. The new design is amazing, and with the ST, you get a better grill design and headlamp look for this latest release. The 2019 Edge ST has a much more sporty design with a black grill and chrome edges. You can feel the power when you accelerate. 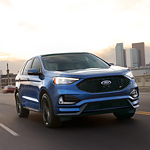 The Ford Edge ST was made to go fast with all-wheel drive and twin-turbocharged engines that put out 335 horsepower and 380 pound-feet of torque. It will be interesting to see what this SUV will mold into for the future, but for now, this is the best version of the SUV so far from the American automaker. Want to test drive the full packages with the latest Ford Edge ST? You can take it for a spin at Appel Ford Inc. located in Brenham.